We left Richard and Laura’s (having experienced an earthquake and not realised it) and headed for Kaikoura, north of Christchurch. As forecast, the rain had set in and a steady fall accompanied us for most of the two and a half hour journey. Kaikoura has set itself up as the capital of whale watching and as we approached the town we could see there was more to the area than the huge marine mammals. The road wound down from the mountain and we spent a few miles driving through gaps in the cliff face like a hole from Hastings mini golf. Holes like this also exist for roads! This gave the drive interest and character as the weather was giving us a stark reminder that had we been less than fortunate our holiday could have been a depressing, overcast break like one of those holidays we have all been on in the UK when the only option is to spend money in the shops to cheer yourself up. Once in the town we headed down to the whale watch centre where we had our final debate about whether we should spend a considerable amount of money to see them and ended up leaving to head further north. 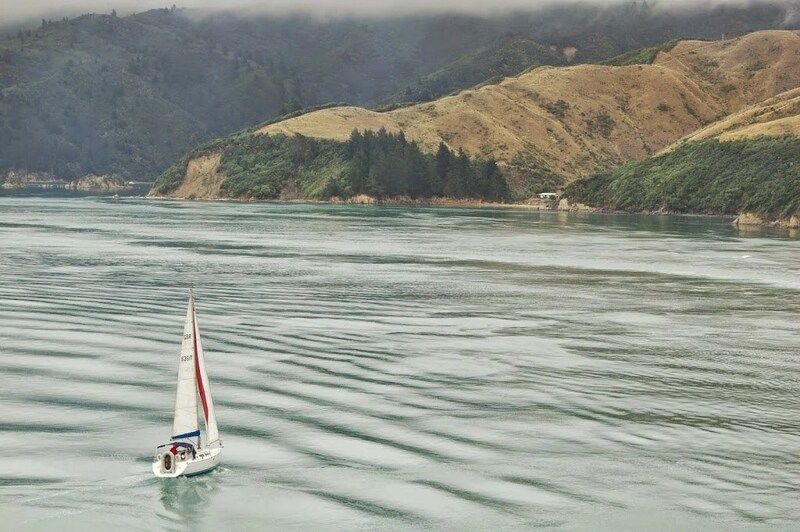 We decided that as we were going to be using the Interislander ferry the following day (to re-acquaint ourselves with the Northland) that camping in the nearby harbour town of Picton would be a sensible option. After a superb lunch in a Cafe in Kaikoura, we made our way north and then an unexpected moment arrived. The rain had stopped and I declared that we should stop at one of the brown lookout signs. I didn’t expect this one to deliver another great moment for us. 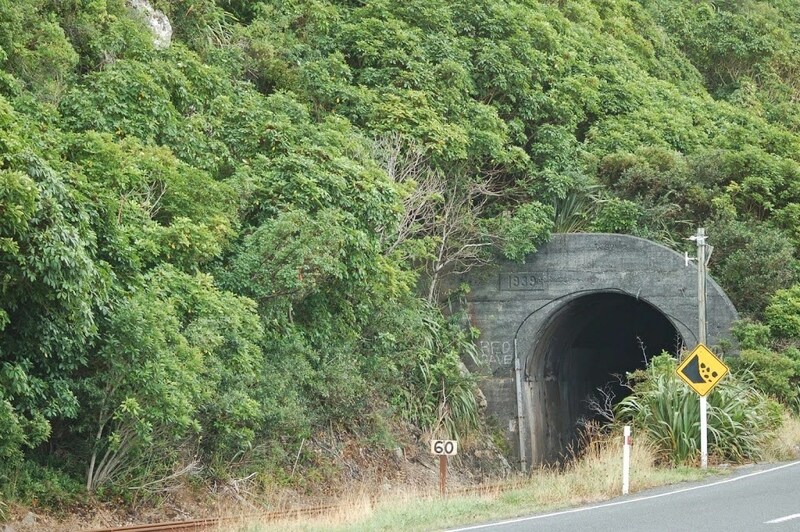 Ohau point is a significant point of interest as it is home to a seal colony. Now for those of you saints that have followed the blog from the beginning there will be a recollection that I’ve discussed seals before! They may have had the odd column inch but these beauties are going to get a few paragraphs! 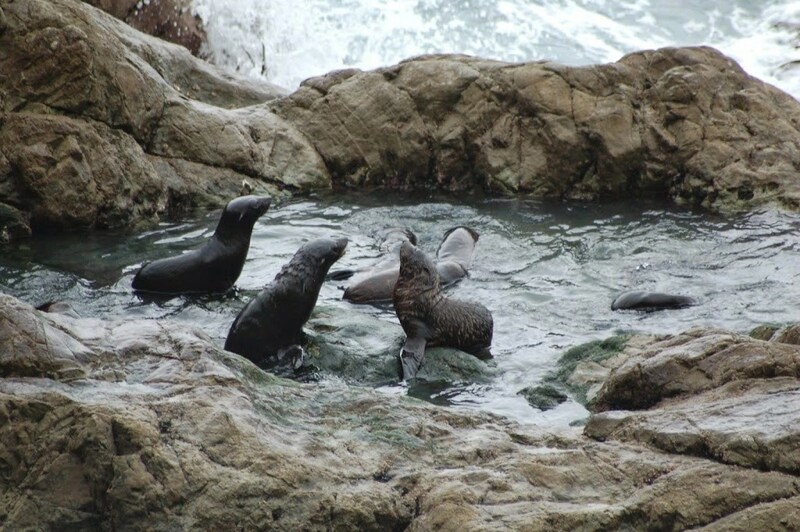 The car park was located right next to state highway 1 and the seals were lolling and flipping on the rocks directly beneath the outcrop. There were seal pups, grizzly old timers and mothers suckling their young. The pups were all busy playing in the rock pools showing off like a group of teenagers on a hot summers day in a hotel pool in Ayia Napa. You could almost hear them squeal “look at me!” and “watch this” as they showed off in front of the girls. Quick! Nab a sunbed before the Germans arrive! The older ones that had whiskers good enough for Movember made lots of deep gargling noises admonishing the pups around them. Unaccustomed as I am to public speaking…. Now, we were transported to any beach in the world where a parent loses their temper with the kids. To see families interact with each other in the same way we do showed us just how we all have the same basic instincts built in. 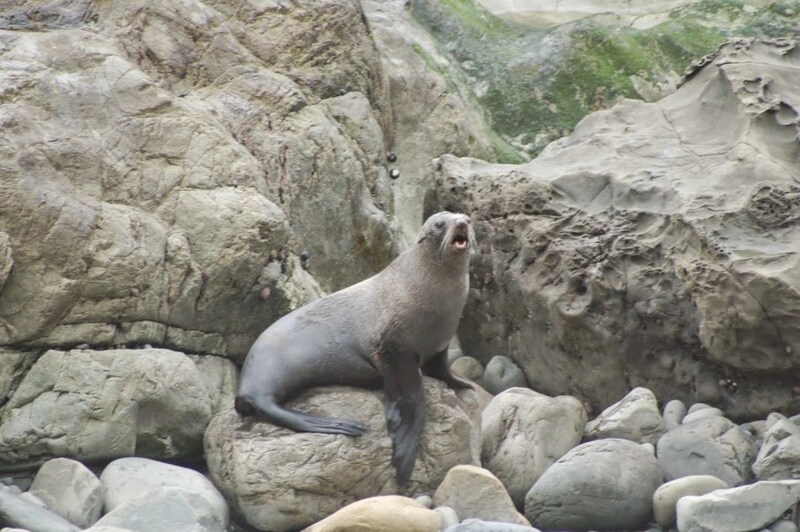 There wasn’t just the odd New Zealand Fur Seal, there were hundreds of them and they put a smile on our faces as the rain clouds moved out to sea leaving us with the clear aqua water which has been a feature of our trip to NZ. Spurred on by our unlikely discovery, we shot through the rest of the countryside to the grape growing town of Blenheim as the miles burned away behind us in a trail of smoke. Another half an hour later and we arrived back at our stating point on the South Island, the weather a completely different proposition to the clear blue sky’s that had seen us in. As we boarded the Interislander the next day, the gloomy grey was still above leaving a misty fug against the hillsides that closed its doors to the leaving tourists. It felt like the shop had closed and turfed all its customers onto the street. The ferry’s pace now was just a little tedious although we still almost managed an altercation with a becalmed yacht that wallowed in the main channel as we sought our passage through it. The numbers on the top of the sail were preceded with a GB! Eventually, he turned the engine on! Impatiently we waited to be free of Wellington and stroked away 3 hours of the seven it would take us to reach Auckland,stopping in a campsite short of the Tongariro National park as the next day (in a change to our schedule), we were heading to Whakapapa village – pronounced ‘fakapapa’ – to experience the top of Mount Ruapehu and see Mt Ngaruhoe aka Mt Doom! There was one more thing to do! 21-Day Travel Itinerary Planner New Zealand – Both Islands!